Those who visit this page hoping to find a large C.V. of exhibitions, training and teachings will be disappointed- Andy isn’t like that. Apart from one of his O levels being in art, Andy has had no further formal art training. He lived and was educated in Northern Ireland. “I recall summer holidays spent cycling on my own around the North Antrim coast and stopping frequently to paint and sketch the castles, cliffs and scenery of that beautiful area.” On leaving school Andy joined the Royal Air Force and served in the RAF Regiment until 1988. On leaving the forces Andy and his wife moved to North Yorkshire, painting was to be his income from that time, supplying galleries countrywide with his wildlife and country scenes. “The opening of The Teesdale Gallery in Barnard Castle in 1992 gave me the opportunity to exhibit my work locally in a quality gallery. Since that time nearly all my work has been exhibited and sold through that outlet until I decided to close it in 2013 which allowed me to fully concentrate on the Wainwrights in Colour project.” Only once has Andy taken up the challenge of submitting work to a major exhibition or show, the Society of Wildlife Artists at the Mall Galleries in London where his selected work was exhibited alongside many of the country’s top artists in the genre. 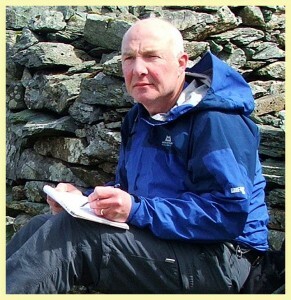 Andy does not teach painting but he does give talks on his work especially on The Wainwrights in Colour project. Use the Contact Me page if you would be interested in booking Andy for a talk.